We are very happy to present the following Guests with more to follow!! Brooklyn born and raised singer/songwriter Eric Stuart has toured the country either on his own or with such rock legends as Peter Frampton, Ringo Starr, and Lynyrd Skynyrd. He's also opened for such acts as Jethro Tull, Julian Cope, Hall and Oates, and Chicago. His first full-length album, Curiosity, was released in 1996 on his own independent label, Widow's Peak Records, and was soon followed up in 1997 with Picture Perfect World (EP). In the summer of 1997, Eric's classic rock & roll style was noticed by Ringo Starr who invited him to open The Ringo Starr and His All-Starr Band Tour, featuring Peter Frampton, Jack Bruce (Cream), Gary Brooker (Procul Harum), and Simon Kirke (Bad Company). That exposure served as a springboard for Eric to open for the Lynyrd Skynyrd, Kenny Wayne Shepherd, Paul Rodgers Tour that same summer. 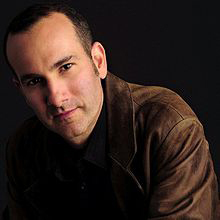 Since then, Eric Stuart has been touring on a regular basis including two U.S. tours with Peter Frampton. In 2000 Frampton later produced Eric's next album, Blue, Dressed In Black along with John Regan and Harvey Jay Goldberg. Now living in Nashville, Eric's songwriting talents have given him the opportunity to begin co-writing with some of Nashville's finest songwriters. He looks forward to many more artistic collaborations in the future. Co-writing is a very interesting journey. Says Eric, "To bare one's creative soul with another is a very vulnerable thing but when there is mutual trust and creative energy in that room it can be an almost spiritual trip." In 2004 Eric released the self-produced independent album Bombshellshocked on RevUp Records. In 2007, he released his next album entitled In The County Of Kings on Widow's Peak Records. Eric Stuart Band has just released the new CD 'Empty Frame Of Reference' 5/2009. . All this while continuing a successful voice acting/directing career, starring in hit shows including Pokemon, Yu-Gi-Oh!, Viva Pinata, Ultimate Muscle, Dinosaur King, Kirby, Slayers, Chaotic, TMNT, in addition to voicing many national radio and TV commercials. Please welcome Special Guest Cherami Leigh to AoiUmaCon 2013!!! Cherami Leigh is an on camera and voice actor. Cherami began her work in the “Anime World” voicing Sae in “Peach Girl”, and has since played Aisa, Pepper, and Miss Golden Week in “One Piece,” Yaz in “Shin Chan,” Primula in “Shuffle,” Setsuna and Akira in “Negima,” Naomi in “Witchblade,” Himawari in “xxxHolic,” Makoto in “Sasami: Magical Girls Club,” Mai in “Ghost Hunt,” Ayano in “Stigma,” Road in “D. Grayman,” Shijima in “Nabari,” Shinooka in “Big Windup,” Honoka in “Kenichi,” Kirimi in “Ouran Host Club,” and recently released “Bamboo Blade” as Tamaki, “Sergeant Frog” as Natsumi, and “Soul Eater” as Patty. She has voiced many video games including Lux Pain as Nami. Cherami began acting at 6 and has worked with LeAnn Rimes, Bernadette Peters, Paul Dano, Ethan Hawke, Ashley Johnson, Wilmer Valderamma, Marcia Gay Harden, Thomas Jane, Avril Lavigne and many others. She has worked on “Fast Food Nation” (directed by: Richard Linklater), “The Hottest State”(directed by: Ethan Hawke), and “The Mist” (directed by: Frank Darabont), she recently appeared as the overachieving “Ginnie Warwick” on NBC’s “Friday Night Lights” , you can also recognize Cherami working alongside Claire Danes in HBO’s film “Temple Grandin”. She has also appeared on NBC’s “CHASE” & ABC’s “The Deep End”. Cherami is currently working on several projects, on and off camera, that she is anxious to share with her fans. We are pleased to welcome Lisa Ortiz to AoiUmaCon! Lisa Ortiz is a veteran voice actress residing in NYC where she lives with her twofabulous felines Fitz and Stan. Most famous for her role as Lina Inverse (which she reprised for Slayers Evolution), and Amy Rose in Sonic the Hedgehog. She began hercareer as the high elf Deedlit in Record of Lodoss War and since then she has gone on to record dozens of anime, series, audiobooks, video games, and films as well aseventually moving behind the microphone as a Producer, Director and Adapter. Her work has appeared in Film festivals as well as on television, and she can currently beheard as Oshawott in Pokemon Black and White, Bellino in Lil’ Chicks, as well as on the upcoming iphone app for the children’s audiobook, the Poky little Puppy.Series include, Magical Do Re Mi (Patina) , Revolutionary Girl Utena (Shiori), WinxClub (Icy/Musa).! AoiUmaCon is proud to announce our newest guest Greg Wicker! 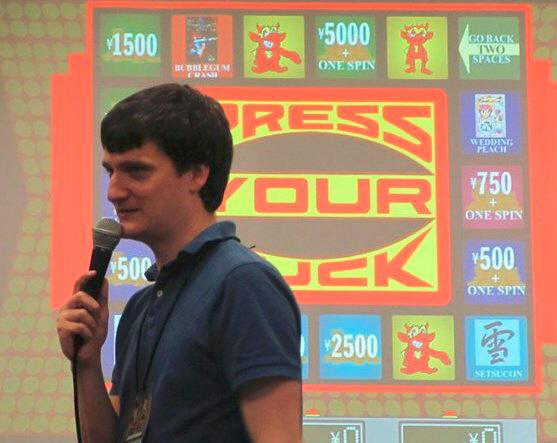 Greg Wicker (or “Greggo” as he’s fondly known) has been producing and hosting game shows at anime conventions since 1999, when he premiered Anime Match Game at Project A-Kon in Dallas. Since then, Greggo has done anime-themed versions of several classic game shows, created a few games of his own, and even had an original project that very nearly turned into an actual television show on Anime Network. These days Greggo is concentrating on perfecting his craft and making game shows available for conventions everywhere, bringing his rapier wit and friendly personality with him wherever he goes. You can see some of Greggo’s past game show efforts on his YouTube page at http://www.youtube.com/gregdasgo or visit his website at http://www.facebook.com/greggosgameshows.